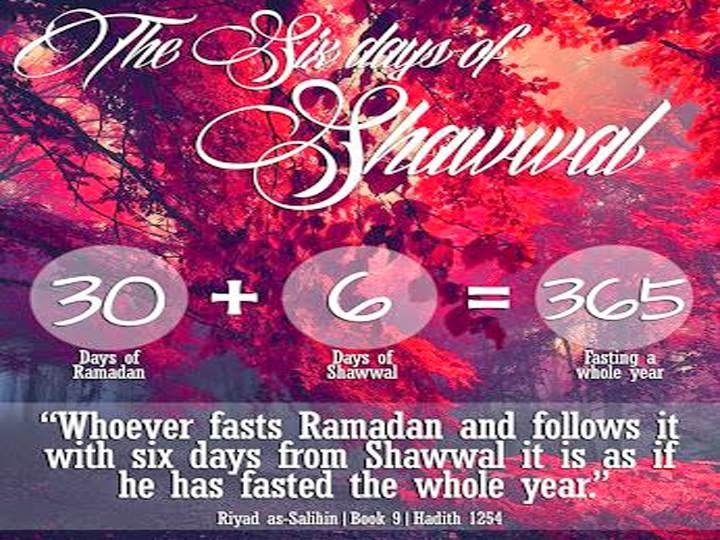 Abu Ayyub al-Ansari (Allah be pleased with him) reported Allah's Messenger (Sallallahu Alaihi Wasallam) as saying: He who observed the fast of Ramadan and then followed it with six (fasts) of Shawwal. it would be as if he fasted perpetually. Urdu Translation: Hazrat Abu Ayyub al-Ansari RadiyAllahu Anhu se Riwayat hai ke RasoolAllah Sallallahu Alaihi Wasallam ne Farmaya ke Jo Aadmi Ramadhan ke Roze rakhe phir us ke Baad Shawwal ke che (6) Roze rakhe ye Hamesha rozey rakhne ki tarah hai. Abu Ayyub (May Allah be pleased with him) reported: The Messenger of Allah (Sallallahu Alaihi Wasallam) said, "He who observes As-Saum (the fasts) in the month of Ramadan, and also observes As-Saum for six days in the month of Shawwal, it is as if he has observed As-Saum for the whole year." Urdu Translation: Hazrat Abu Ayyub RadiyAllahu Anhu se Riwayat hai ke RasoolAllah Sallallahu Alaihi Wasallam ne Farmaya: Jis ne Ramadhan ke roze rakhe, phir us ke baad Che (6) Roze Shawwal ke rakh liye to us ne goya hamesha roze rakhe.